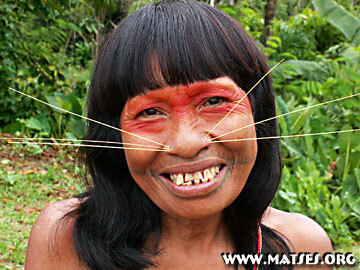 The Matsés people (who are also commonly called Mayorunas in Brazil) are often affectionately referred to as the "cat people" due to the characteristic "whiskers" and facial tattoos. Presently, there are about 2200 Matsés living in the Yavarí Valley of Peru and Brazil, with the majority residing in Peru. The Matsés speak a language of the Panoan linguistic family that is closely aligned with the dialects that the Matis and Korubo Indians speak. In 1969, the Matsés first made permanent contact with the outside world when they accepted Christian missionaries into their communities. Since then, they have preserved much of the their culture and way of life, still hunting and fishing as their ancestors had for millennia. Most importantly, many communities have retained their unique traditional medicine and knowledge of medicinal plants whose secrets scientists are only now discovering. 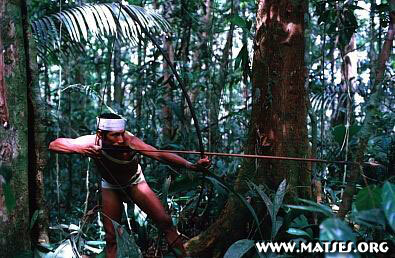 While many other Amazonian tribes use blowguns to hunt, the Matsés are specialists in the use of bows and arrows. Formerly, they were used for war, but presently are only used for hunting game. Arrows measure about two meters in length and very complex workmanship is involved in their manufacture. Matsés arrows are incredible works of art and craftsmanship that illustrate their strong work ethic and allow them to maintain their traditional way of life without dependence on outside society. In contrast, most other indigenous groups use shotguns exclusively, making them dependent on expensive nonrenewable resources such as shotgun shells to hunt. With few exceptions, the Matsés people have no regular economic income, with self-sufficient hunting and fishing being their primary economic activities. 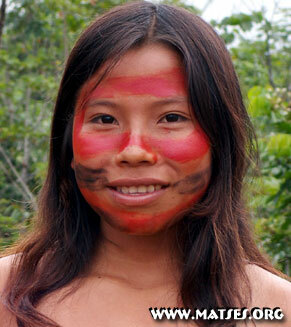 Since 1998, the Matsés have had legal title to their own lands. The Matsés titled lands comprise 452,735 hectares along the Yavarí, Yaquerana, and Gálvez Rivers. At present, no outsiders are extracting resources (timber, game, or fruits) from the land, thus conserving the resources and making a sustainable existence possible. Despite the richness of their culture and way of life, the Matsés people live in extreme poverty with diseases such as malaria and hepatitis extracting an incredible toll in terms of human suffering and mortality. Lack of basic services such as health and education jeopardizes the ability of the Matsés to defend their lands and way of life.